It is a goal I spent literally my entire short, inept and utterly futile footballing career trying to match. It is goal which gave real hope to the Toon Army fans that they might finally win a trophy after more than 40 years of hurt. It is a goal, more importantly, which epitomises what flairniacs all over the world regard as a benchmark. As the ball drifted majestically through the air, as if transported on a carpet of perfection, Philippe Albert and the rest of St. James’ Park knew it was destined for the net. Peter Schmeichel watched on helplessly as the net bulged and Albert set off on a delirious celebratory jaunt, moustache bristling with a mixture of pride and disbelief. In short: pick. It. Out. The match, of course, ended 5-0 to Newcastle but sadly the men in black and white were not able to deliver title glory. Philippe Julien Albert was born in Belgium on 10 August 1967. He began his career as a conductor of flair when he signed for Charleroi in 1986. He made 65 appearances for the Belgian outfit, scoring 7 goals, before moving on to KV Mechelen (87 apps, 5 goals) and Anderlect (50 apps, 9 goals). He will be forever remembered though for a 5 year spell on Tyneside, seemingly characterised by endless 4-3 defeats to Liverpool. Even though Big Phil, as no one ever called him, was not able to deliver silverware to the Geordies, he left an indelible mark on those of us lucky enough to have seen him play. His somewhat cavalier defending was a joy to behold and characterised an era of the Premiership where attacking flair was at the forefront of what all teams regarded as important. His appearance may have made him look like an athletic Ron Jeremy, his skills around the box were just as good, but it was the sense that he generally loved playing the game which made him such a fans’ favourite on Tyneside. 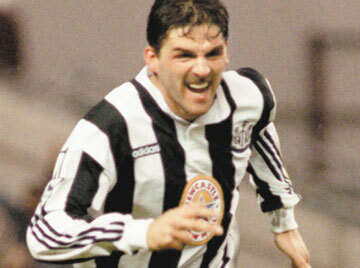 Albert played 96 games for Newcastle, the most he ever played for a single club, and scored 8 goals during his stay. I can’t remember them all, but I’m going to assume that they were all brilliant. After falling out of favour at Newcastle, he completed a loan move to Fulham where he made just 13 appearances. Finally leaving England in summer 1999, he signed once again for Charleroi. He played just one season for his original team, making just 14 appearances. He hung up his boots in the summer of 2000. I’m sure he felt that his moustache and nonchalant attitude had no place in the fast, frenetic Premiership that was to come. Since retiring, Albert has gone on to become a successful pundit in his native Belgium – making regular return trips to summarise on matches at St. James’. In addition, he has now turned his hand to business, hoping to display the same levels of entrepreneurial flair that he did of the footballing kind. Quite brilliantly, he now runs a very successful fruit and vegetable business back in his homeland. For a man as unique as Philippe Albert, he was never going to drift aimlessly into coaching.